Heat oven to 450°F. Line cookie sheet with foil. Spray with cooking spray. Place frozen pizza on cookie sheet. Top with beans and cheese. Bake 15 to 17 minutes or until center is thoroughly heated and cheese is melted. Remove pizza from oven. Sprinkle with tomato and tortilla chips. In small bowl, mix dressing and pepper sauce. Drizzle over pizza. Serve with additional tortilla chips, if desired. 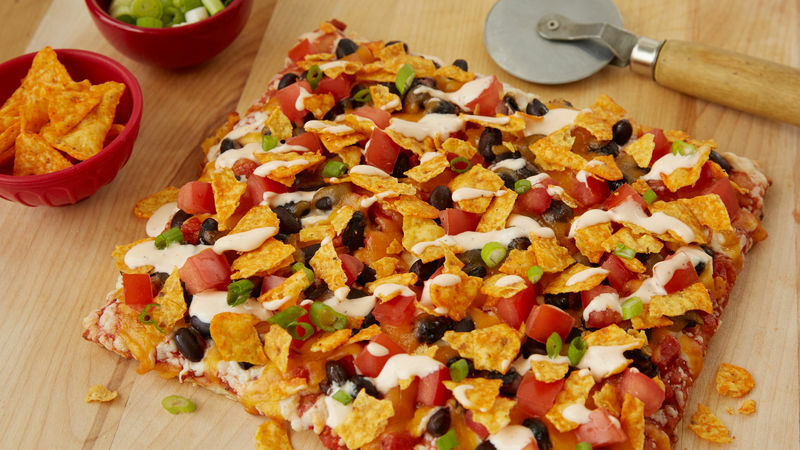 Feel free to vary the ingredients on the pizza to meet your nacho needs. The Hidden Valley and Original Ranch trademarks and logos are registered trademarks of the HV Food Products Company.